What? Can there possibly be more to life than jewelry making? Ha. Of course there is! From time to time I’ll post about other things I’ve done or made, sharing my successes (or perhaps even failures) with you. Today’s post is of a recent success! I typically get my mom and grandma flowers for Mother’s Day. That was my plan again this year, until my mom said, just a week before Mother’s Day, DO NOT get me flowers! :O That threw a wrench in my plans! She had a very valid reason…they’ve got 4, yes, FOUR cats at their home, and they love to chow down on a good flower bouquet. 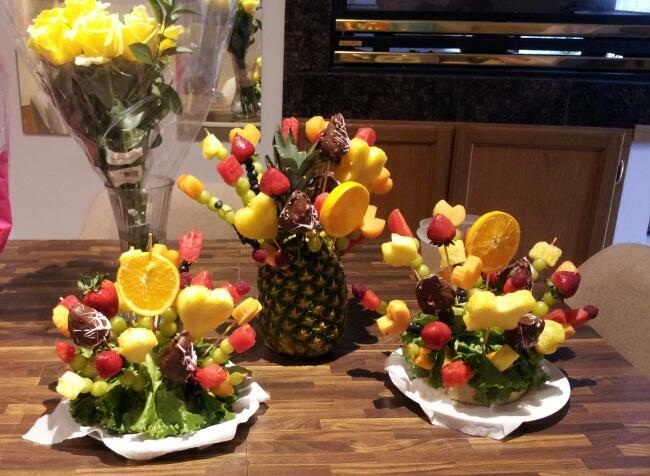 So, instead she said she wanted “one of those fruit bouquets.” Alrighty then. Well, a search online led me to Edible Arrangements, and there was one conveniently located near me. But one look at the prices and I cringed. The cheapest starts at about $50, and to get a size that actually makes it look like you care was $63. I couldn’t justify spending that much money on fruit. “I could do this myself” went through my head, but I wasn’t sure I wanted to do all that. I turned to my friends to see if they had seen any alternatives. Not really. So, I turned instead to Pinterest. Ya gotta love Pinterest, it never lets you down! I found an awesome bit of pinspiration where a pineapple was used as the vase, and I was sold on that concept. I also saw pins using melons as the base, so I decided I would do that as well, since I also wanted to make one for my grandma too. On Friday night I went to Woodman’s, my favorite grocery store, and bought all the fruit I needed. This allowed for some ripening time, but I had an event to sell my jewelry at the following day, so it was also to save time. Sunday morning I awoke and started working on the bouquets first thing. FOUR hours and 2 achey feet later, they were finished. I found out later on that that four hours I spent were entirely worth it as the bouquets were an absolute hit. If you are thinking of making your own DIY fruit bouquet, I can help you out with some tips and advice based on what I learned making my first ever fruit bouquets. Here’s a step-by-step photo tutorial, just click the image to enlarge. Below this picture you’ll find my detailed instructions. Prepare all of the “cut out” fruits. Cut the head and bottom off of one pineapple, then slice the remaining into about 3/4″ slices. Using the cutouts or biscuit cutters, make the cutouts. TIP: some of my slices were a little thick or crooked, and I had a hard time getting the cookie cutter to go all the way through. It also helped to use a folded up kitchen towel to press down on the cutter, as it hurt my hand otherwise. I used a sharp knife to cut away any slivers of pineapple that were stuck on the cut-out shape. Cut the orange into thick slices. A word on the kiwi. Mine were too ripe. Even after cutting them in thick slices, they still fell apart and right off the skewers. If you want to use kiwi, make sure it’s firm. Salvage the remaining fruit by cutting it into chunks that you can use as filler in the arrangement or eat as fruit salad later. Using the skewers, carefully place the fruit cutouts onto the flat end of the skewer. TIP! After I had several skewers placed I realized that the bouquets looked a little sparse and went back on some of them and put grapes or blueberries on the skewer, then the “main” fruit on top. This also helps to prevent the fruit from sliding down the skewer. So, save yourself some time and load your skewer up first. TIP: Be careful with the skewers. Some of mine had slivers and I didn’t want to use those. I ran them under water to dampen them before cutting. Odd numbers are always appealing to the eye, so work in odd numbers when placing the larger pieces. I put the orange in the center and worked around that. Cut the skewers just as you would real flower stems to vary the height. Place 3 (or 5) chocolate covered strawberries evenly and at varying heights. Use the remaining fruit to fill in the rest of bouquet. TIP: Raspberries need help staying on the skewer so I made sure I had something else underneath it and then put the raspberry at the end. For the melon arrangement, I realized it looked a little naked, so I ran out and got some leafy green lettuce. I washed it, dried it with toweling and then ripped it into large pieces. I stuffed the pieces in between the skewers to cover up the melon. If you’re not using these right away, be sure to refrigerate them! I got 4 bouquets out of all of the fruit I bought. With the 4th one, I used a small slice of cantaloupe and put the head of the pineapple on top of it. You’ll see the finished bouquet under step 6 in the tutorial photos. This arrangement did not need lettuce as it was shorter and the pineapple leaves added greenery. Enjoy! These were a HUGE hit with everyone. They looked very impressive and my mom was super happy to get exactly what she wanted for Mother’s Day. I don’t think I’d go through the trouble of making these often, but for a special ocassion, or for a different backyard BBQ dinner centerpiece, etc. this DIY flower bouquet would be perfect. I’m sure it’ll go a lot faster the next time I make one. And you can’t beat the price. I made 4 arrangements for less than the price of one from the brand name store.